David Wright missed Saturday’s game with flu-like symptoms, a nasty bug that has been going around the Mets’ clubhouse and a refreshing reminder that the team’s third baseman is at least vaguely human, still susceptible to contagious illness. Wright came back Sunday and went 2-for-4 with a double, a walk and a pair of RBIs in the Mets’ 6-5 win over the Blue Jays. That’s pretty much how it has gone for Wright this year, all year. Every time when it has looked like something might shake him from his torrid stretch, he has returned somehow stronger. After four good games to start the season, Wright broke his pinkie and the disable list loomed. But Wright instead sat out three games and came back to go 3-for-5 with a homer. When Wright endured a four-game cold stretch that dropped his OPS to a season-low (season-low!) .952 on April 24, he got eight hits in his next 16 at-bats with a homer, three doubles and seven walks to bring his on-base percentage back up over .500. So what’s happening? Beats me. Knowing what’s going right for Wright in 2012 would require understanding what went wrong for him the last few seasons — beyond the broken back in 2011, of course. It sure looks like Wright is having less trouble with pitches on the outside half of the plate, taking them to the opposite field instead of flailing at them. And indeed, according to baseball reference, Wright has 13 hits to right field in 127 at-bats in 2012 after getting only 15 hits to right in 387 at-bats in 2011 and 17 in 587 in 2010. – Wright has walked more than he has struck out. This has never happened in a full season of his career. His walk rate — 18.1 percent — is well higher than it was in his best season in 2007. And at 14.8 percent, his strikeout rate is lower than it has been in any full season of his career and well lower than the 22.9 percent rate at which he whiffed from 2009-2011. – Wright has not hit home runs at the rate he did from 2005-2008, but his extra-base hit percentage has been higher than it has been for any full season. This should not really come as a surprise, since he’s hitting .412. – Wright has a .476 batting average on balls in play, which is more than 100 points better than his career norm. But his 30.3 percent line-drive rate is also way above his career average. You don’t need a stat to know this: He’s crushing the ball. Also, per Fangraphs at least, he has yet to hit an infield pop-up in 2012. – Wright has swung at fewer pitches out of the strike zone and made contact with more of them than he ever has in a full season in the past. Only three hitters in the Majors have swung at a lower percentage of pitches out of the strike zone than Wright has in 2012. – Wright’s 5.6 percent swinging-strike rate in 2012 would be by far his lowest for a full season. His career rate is 7.6 percent. Whatever. I could point to a dozen other stats to say that David Wright has been awesome in 2012, and you don’t need any of them to know that. 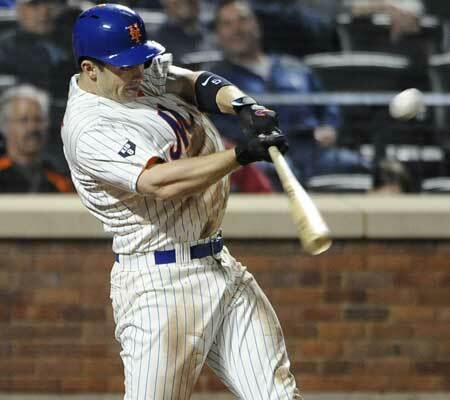 David Wright has been awesome in 2012. Just as he’s not likely to maintain his .412 batting average, he’s also not likely to maintain any of the above-listed rates. But the stats all seem to agree with what our eyes have been saying for weeks: He’s locked in, and it’s sweet.